My love of film began before I can even remember when I'd flip through my mama's photo albums and pore through the massive tubs of snapshots that were stacked in our living room. There was so much magic in the alchemy of it and how really a photograph was simply that: capturing light. And what an incredibly heady thing that in capturing light, you're also preserving a memory; you're painting emotion and feelings and creating a time machine. Those tubs of memories are brimming with beloved family members no longer with us, my sisters and I bundled & Bambi-legged on a frozen pond in Maine...they're my mother's un-lined face and grandmother's hands and my early ballet performances and Sarah's softball games and Molly's jam-streaked infant cheeks. Digging through those albums I find my early university darkroom experiments: print after print of stark Florentine winter street scenes, black and white studies of paint covered fingers and some mediocre self-portraits. But it was during that fated, tumultuous semester in Florence at 19 where I truly fell in love with film. When all auto settings were switched to manual and I would spend hours squinting over trays of chemicals and watching that beautiful alchemy happen and see real people and places magically fade in through the rippling developing liquid. When I moved to Hamburg some 5 years later, having not stepped into a darkroom in some time, I was walking through a flea market and picked up a 35 year old Minolta SRT-II in pristine condition for €20. Them I grabbed two Polaroid cameras for €10 each. And my collection grew and grew and the rolls of film and stacks of prints with them. So when I decided to set my wedding photography business up another 5 years later, the natural inclination was to shoot film photography again. Obviously with the convenience and incredible technology of digital photography (never mind cost-effectiveness), the expense of being a film-exclusive wedding photographer was never an option. But I had to include my love of this amazing art form (that is having a major resurgence!) in some way and my solution was to add an optional extra to my wedding packages: analogue photography! This included a broad spectrum of vintage Polaroids, the modern Fuji Instax and a few rolls of my favourite film, the rich and dreamy Kodak Portra 400. I honestly didn't have any clue how this would work but I knew that if a few couples would just trust me with the magic (and know that digital was the priority anyway) that I could deliver something unique and imperfect and so unlike the pristine digital files they would also receive, we would have something special on our hands. The WONDERFUL Chantelle and Simon were the first of my 2017 couples to take me up on this crazy add-on service. Chantelle is herself a keen photographer and lover of all vintage and they were so excited for the possibility of film and showing off another perspective of the big day. After an absolute nightmare just five days before their wedding that neccessitated a last minute venue change - yes really! - my second shooter Jenn and I arrived at the beautifully classic Leigh Town Hall for a (very warm!) early summer family-filled ceremony. 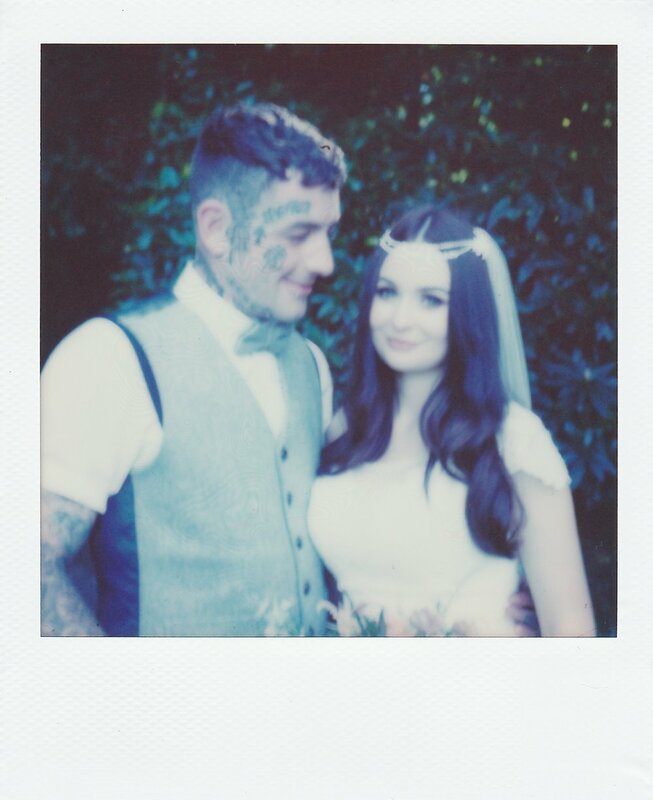 Jenn has a massive background in film photography and, in particular, her Lomography and Polaroid work is spectacular so I knew I had someone fully comfortable to shoot alongside and create some film magic that Chantelle and Simon would treasure forever. Chantelle was 20-ish weeks pregnant with their son Jackson on the day of the wedding and the glow this beautiful bride emitted is something that just cannot be faked. Despite the circumstances behind the venue change, this amazingly warm and easygoing couple stayed relaxed, stress-free and, most importantly, FUN throughout the day. They were just so excited to be married to each other and join their families together that it didn't matter at all that it wasn't quite what they had initially envisioned for their wedding day. What followed was a day filled with tonnes of laughter, buckets of tears from both bride AND groom (not going to lie, I definitely shed a few during the AMAZING speeches) at Leigh Cricket Club where we found the most STUNNING golden hour I've ever encountered. Thank you so so much again to Chantelle & Simon and the extended Foster/Briscoe family for welcoming Jenn and I so warmly and trusting our vision by playing around with some serious throwback equipment. The most wonderful part of this gorgeous day was what, in the end, it's all about: two people so madly/wildly/perfectly in love whose glow extends out like sunbeams and touches everyone in their orbit. What a marvelous experience it was spending time with you guys. Thank you so so much.